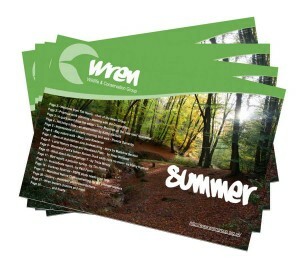 The Wren is the Group’s Newsletter, published normally about four times a year. We are now keen to send this to members by email which will save us both time and expense and will ensure you can always have colour photographs! Please ensure the editor has your email address (if any); less detailed, hard copy versions will still be sent to those members who prefer this. Because this is an electronic newsletter we can include links to other sites and snippets of information. When you see blue underlined text it means that it is a link. Just click on the link for more information or to be taken to another site. Clicking the link will always take you to another frame so your newsletter will still be there in the background – just close the new window to continue reading your newsletter. The editor of the Newsletter welcomes contributions from our members and our readers. These can be sent, preferably in the form of a Word .doc file, to the e-mail address below. The editor reserves the right to edit these appropriately, and to decide whether or not they will be used. Photographs are also welcome, but preferably sent as a file size of less than 1 Mb. Views and opinions expressed in the Newsletter are not necessarily those of the Wren Group Committee.